HyperText Markup Language (HTML) is the language behind most web pages. The language is made up of elements that describe the structure of the content on a web page. HTML is maintained by two separate groups: the World Wide Web Consortium (W3C) and WHATWG. See https://www.w3.org/html/ and https://html.spec.whatwg.org/ for the specifications. In this lesson, we will look at the basics of HTML. Learn to create a simple HTML page. Learn about HTML elements and attributes. Create the skeleton of an HTML document. 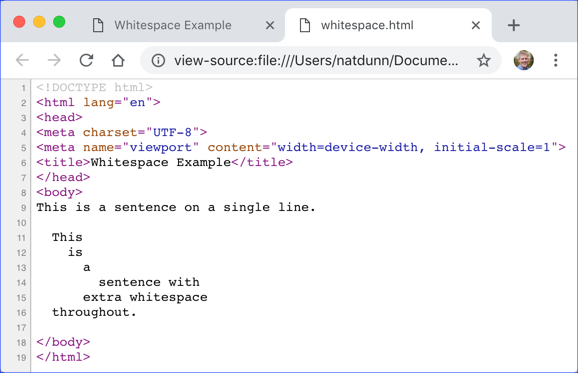 Learn about whitespace and HTML. Learn to output special characters in HTML. Learn about the history of HTML. In this exercise, you will create your first HTML document by simply copying the text shown below. The purpose is to give you some sense of the structure of an HTML document. Create a new file in your editor. Save the file as hello-world.html in the HTMLBasics/Exercises folder. Style blocks, which contain Cascading Style Sheet rules (<style>). References (or links) to external s (<link>). The <body> element contains all of the content that appears on the page itself. Tags that can be placed within the scope of <body> tag	will be covered thoroughly in this course. Extra whitespace is ignored in HTML. This means that all hard returns, tabs, and multiple spaces are condensed into a single space for display purposes. This is a sentence on a single line. The two sentences in the code above will be rendered in exactly the same way. Notice that Chrome does see all the white space in the page source. But it condenses it when it presents the page. Tags often have attributes for further defining the element. Attributes usually come in name-value pairs. The order of attributes is not important. The forward slash (/) at the end, just before the close angle bracket (>), explicitly indicates that this tag is closed. It also makes the tag XML compliant. In general, it is not necessary to use this shortcut close, but it also doesn't cause any harm. Our only recommendation is that if you use it, use it consistently. Special characters (i.e., characters that do not show up on your keyboard) can be added to HTML pages using entity names and numbers. For example, a copyright symbol () can be added using &copy; or &#169;. The following table shows some of the more common character references. HTML was invented in the early 1990s. In 1996, the World Wide Web Consortium (W3C) began maintaining the HTML specification. At that point HTML was already on version 2.0. HTML 3.2 and HTML 4.0 were both released in 1997. XHTML, a separate XML version of HTML, was released in 2000. HTML5 was released in 2014, updated to HTML 5.1 (now with a space) in 2016, and then to HTML 5.2 in 2017. Today, two separate groups, the W3C and WHATWG manage separate HTML specifications, with at least a little tension between the two groups. 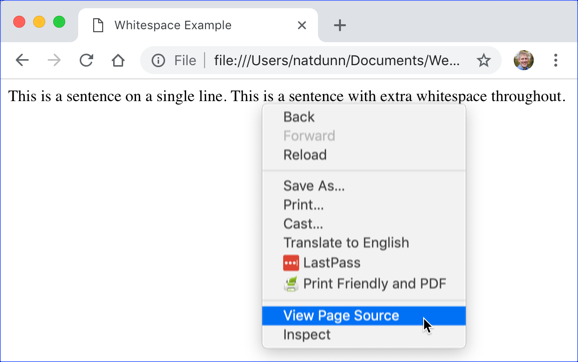 From WHATWG's website: "Although we have asked them to stop doing so, the W3C also republishes some parts of this specification as separate documents." As a web developer, you don't need to be too concerned with this history. The important question is: what can you do today? Probably the best, most up-to-date online reference is kept by Mozilla at https://developer.mozilla.org/en-US/docs/Web/HTML/Reference. This DOCTYPE is completely backward compatible and will make all browsers work in "standards mode." The first specifies the character set and the second makes web pages adjust for different screen sizes. You may hear a lot about HTML5 or HTML 5 (WHATWG calls it HTML5. The W3C calls it HTML 5 with a space.). For a few years, the distinction between HTML 4 and HTML 5 was important. Today, you can simply think of everything as just HTML. The HTML you use will be determined more by what modern browsers support than by what the specifications specify. Helping a user agent select glyph variants for high quality typography. Helping a user agent choose a set of quotation marks. Helping a user agent make decisions about hyphenation, ligatures, and spacing. Assisting spell checkers and grammar checkers.